A Geospatial Analyst’s responsibility is to develop ways to obtain crucial data from geographical information bases, systems or any source and use the information so received at various fields or industries. To perform these tasks a Geospatial Analyst can employ different methods like overlays, computer analysis, physical maps or mapping software. As the responsibilities of a Geospatial Analyst is too crucial for the firm, they are required to be highly intellectual and analytical, use all the necessary tools and sources like surveying methodology or GPS or any other source for that matter. 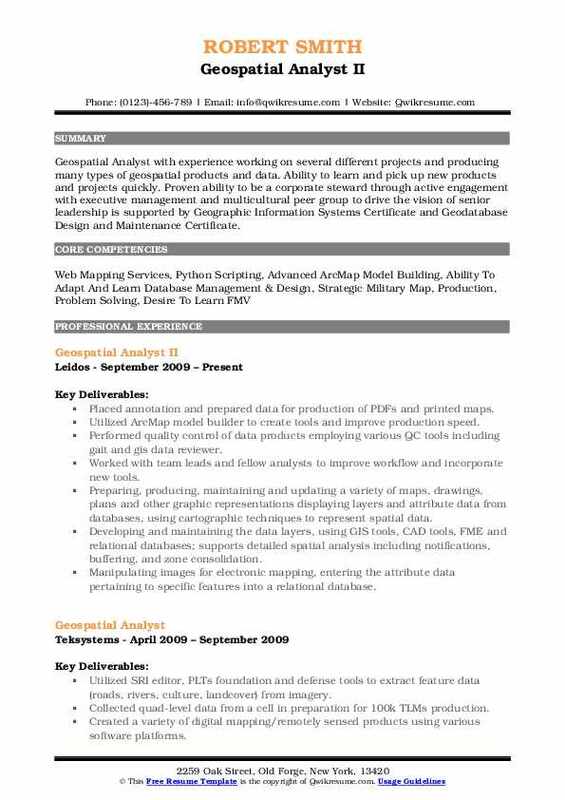 The hiring companies need a Geospatial Analyst Resume Sample that contains a minimum bachelor’s degree in the relevant discipline such as Geomatics, Geosciences, Geography or Anthropology for this post. 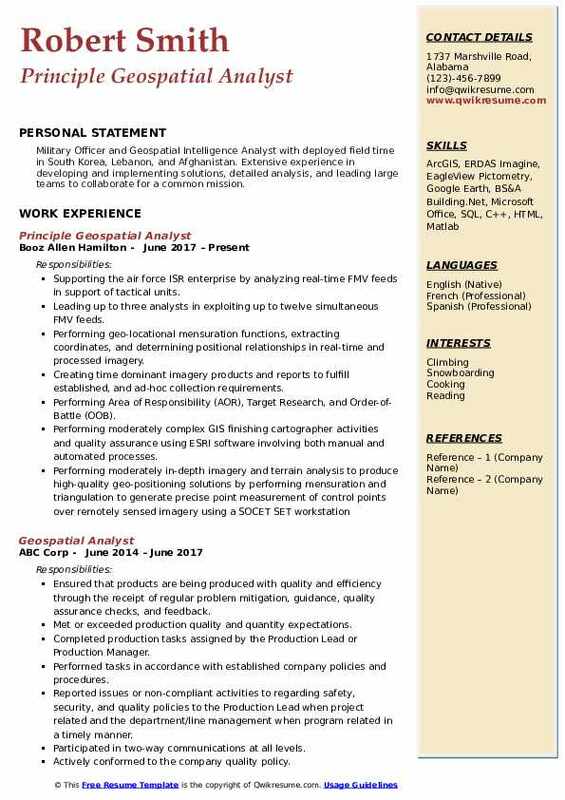 Previous experience in drafting, engineering, surveying, and cartography will be an additional asset for seeking this post. Summary : Geospatial Analyst proficient using softcopy photogrammetric techniques to extract and classify thematic features from digital imagery. The photointerpretation skills are complemented by the ability to conduct detailed ground truth field verification for signature development and accuracy assessment surveys. Well versed in Socket Set and ESRI ArcGIS software and is knowledgeable on a variety of classification systems to include NWI, FLUCCS, Scheme, and others. Responsibilities included analyzing imagery using directed search areas with a team of analysts to aid in the detection. Verification that production teams data is in compliance with project-specific guidance and the scope of work. Developed automated checks utilizing SQL queries and data reviewer batch jobs. Coordinated with multiple offices and subcontractors regarding data quality and guidance changes. Set up and utilized geospatial analysis integrity tool customer supplied software that verifies topological relations between features as designated by the project's scope of work. Tracked error rates for trends indicating the need for refresher training of production team members. Packaged and shipped completed data and supporting documentation to the client. Updated existing databases through change detection utilizing the most current imagery. Collaborated with various intelligence community agencies to support humanitarian operations. 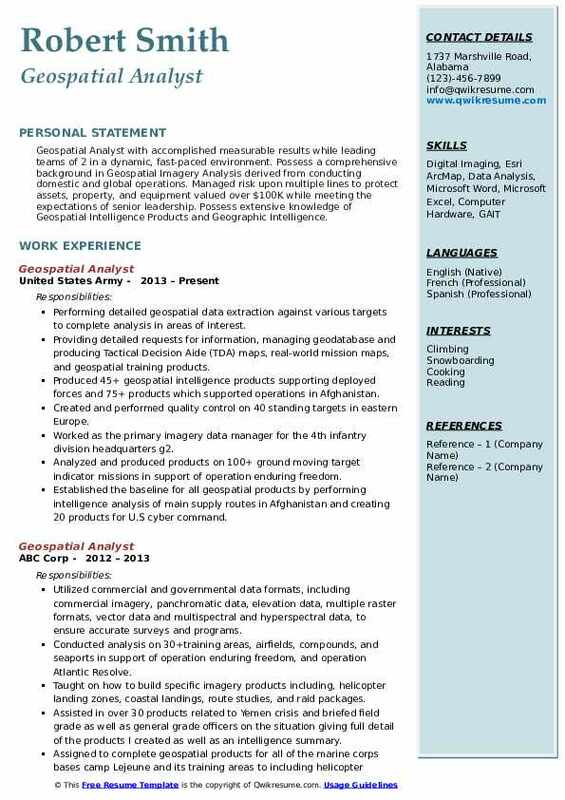 Objective : Junior Geospatial Analyst with 4 years of expeirnece and with a well-rounded background in multi-INT (FUSION) intelligence gathering, QA/QC, electro-optical, thermal infrared, SAR, Urban Tactical Planning, and product dissemination. Led efforts in creating geospatial features, integrating geospatial datasets, and the production of geographic visualizations supporting Osint research on conflicts in Burma, the Democratic Republic of the Congo, Indonesia,. Analyzing, consolidating, summarizing, and disseminating the Geoint, Imint, and Osint. Performing quality assurance and quality control to manage the integrity and consistency of geospatial data. Assisted in the production of world banks Economic and Social Impact Analysis (ESIAs) and Diagnostic for National Action (DNAs) covering the middle east, south, and central Asia. Participated in an NGA pilot project incorporating human geography with traditional geospatial intelligence. Consultant for Advanced Technical Intelligence Center (ATIC) received a certificate in intelligence analysis. Completed a rigorous 10-week human capital development course in intelligence analysis. Practiced in the intelligence collection cycle, structured analytical techniques, intelligence reporting, and conducting. 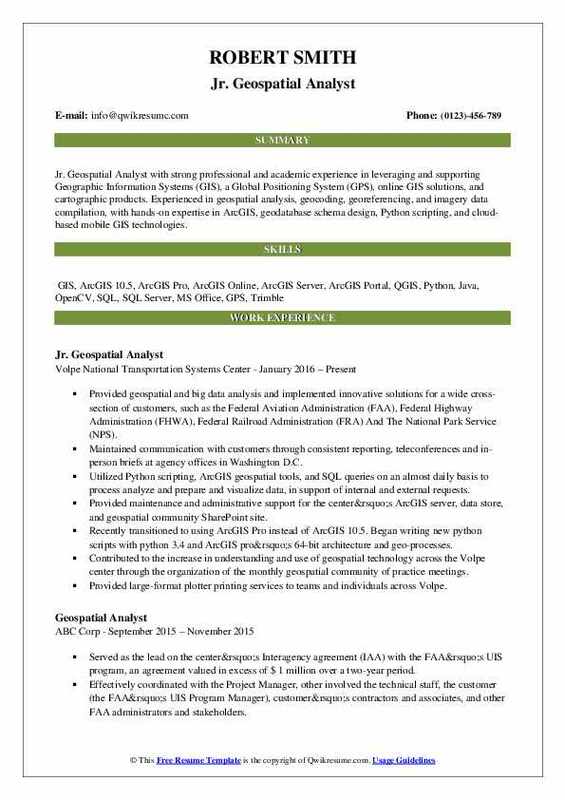 Objective : Jr. Geospatial Analyst with strong professional and academic experience in leveraging and supporting Geographic Information Systems (GIS), a Global Positioning System (GPS), online GIS solutions, and cartographic products. 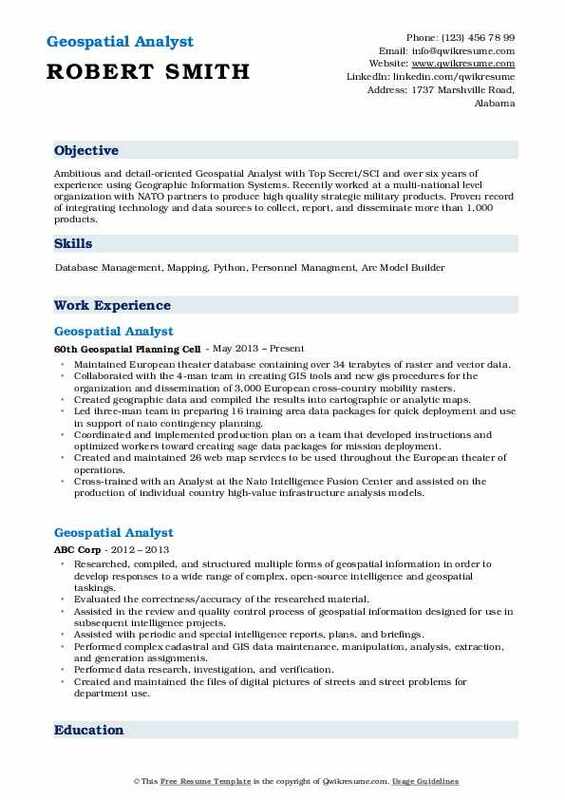 Experienced in geospatial analysis, geocoding, georeferencing, and imagery data compilation, with hands-on expertise in ArcGIS, geodatabase schema design, Python scripting, and cloud-based mobile GIS technologies. Provided geospatial and big data analysis and implemented innovative solutions for a wide cross-section of customers, such as the Federal Aviation Administration (FAA), Federal Highway Administration (FHWA), Federal Railroad Administration (FRA) And The National Park Service (NPS). Maintained communication with customers through consistent reporting, teleconferences and in-person briefs at agency offices in Washington D.C.
Utilized Python scripting, ArcGIS geospatial tools, and SQL queries on an almost daily basis to process analyze and prepare and visualize data, in support of internal and external requests. Provided maintenance and administrative support for the center’s ArcGIS server, data store, and geospatial community SharePoint site. Recently transitioned to using ArcGIS Pro instead of ArcGIS 10.5. Began writing new python scripts with python 3.4 and ArcGIS pro’s 64-bit architecture and geo-processes. Contributed to the increase in understanding and use of geospatial technology across the Volpe center through the organization of the monthly geospatial community of practice meetings. Provided large-format plotter printing services to teams and individuals across Volpe. Summary : Senior Geospatial Analyst proficient at analytical writing using the bottom line up front structure, writing succinctly, and conducting oral briefs practiced in alternative futures analysis and actively participated in scenario development and simulation exercises skilled at hypothesis generation and validation, determining the efficacy of causal factors/events, and analyzing alternative futures and their consequences relating to strategy development. Constructed activity analysis of high-priority targets, including geospatial and behavioral analytic models, thus increasing the overall understanding of high-priority targets. Conducted an in-depth geospatial analysis in support of crucial discoveries regarding the target's operations. Greatly increased the situational awareness of key decision makers and shaped national-level collection efforts. Provided in-depth analysis that was used in numerous product reports, including multiple Sigint assessment reports that profiled very high-value targets. Continually received positive feedback from multiple agencies. Recognized as the NSA/CSS Georgia military performer of the quarter for the 4th quarter of 2013. Selected as the top operator among all junior-enlisted personnel on site. Completed a highly selective 10-month ESRI GIS program, which focused on the use of ArcGIS applications to perform the advanced geospatial analysis. Used experience and skills, as well as extensive collaboration amongst team members to ensure delivery of a complete, efficient, and effective training program. Headline : Geospatial Analyst with accomplished measurable results while leading teams of 2 in a dynamic, fast-paced environment. Possess a comprehensive background in Geospatial Imagery Analysis derived from conducting domestic and global operations. Managed risk upon multiple lines to protect assets, property, and equipment valued over $100K while meeting the expectations of senior leadership. Possess extensive knowledge of Geospatial Intelligence Products and Geographic Intelligence. Performing detailed geospatial data extraction against various targets to complete analysis in areas of interest. Providing detailed requests for information, managing geodatabase and producing Tactical Decision Aide (TDA) maps, real-world mission maps, and geospatial training products. Produced 45+ geospatial intelligence products supporting deployed forces and 75+ products which supported operations in Afghanistan. Created and performed quality control on 40 standing targets in eastern Europe. Worked as the primary imagery data manager for the 4th infantry division headquarters g2. Analyzed and produced products on 100+ ground moving target indicator missions in support of operation enduring freedom. Established the baseline for all geospatial products by performing intelligence analysis of main supply routes in Afghanistan and creating 20 products for U.S cyber command. Performed raster data retrieval, storage and analysis through controlled image base (CIB-1, 5, 10), topographic line maps, digital terrain elevation data, shuttle radar topography mission, national technical means, lidar and high-resolution terrain elevation. Built capabilities briefs to assist the training of marines that were waiting to go to imagery school. 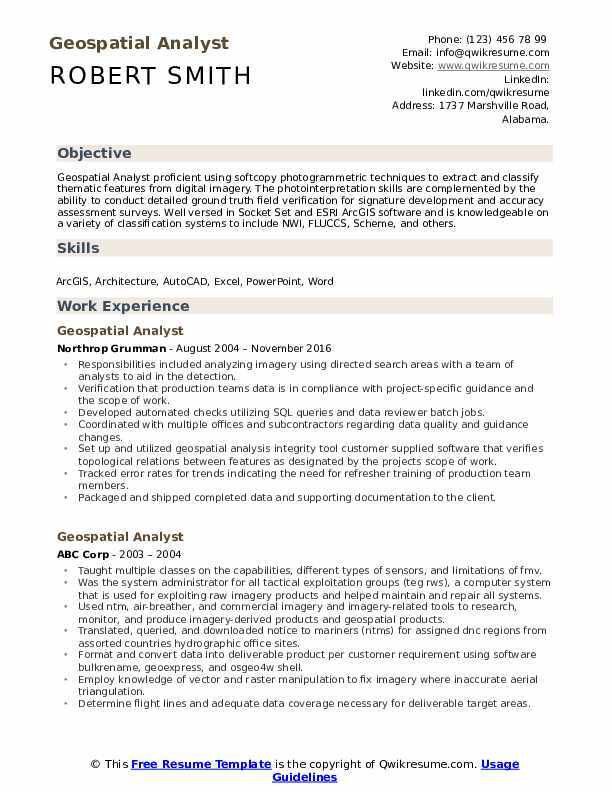 Headline : Ambitious and detail-oriented Geospatial Analyst with Top Secret/SCI and over six years of experience using Geographic Information Systems. Recently worked at a multi-national level organization with NATO partners to produce high quality strategic military products. Proven record of integrating technology and data sources to collect, report, and disseminate more than 1,000 products. Maintained European theater database containing over 34 terabytes of raster and vector data. Collaborated with the 4-man team in creating GIS tools and new gis procedures for the organization and dissemination of 3,000 European cross-country mobility rasters. Created geographic data and compiled the results into cartographic or analytic maps. Led three-man team in preparing 16 training area data packages for quick deployment and use in support of nato contingency planning. Coordinated and implemented production plan on a team that developed instructions and optimized workers toward creating sage data packages for mission deployment. Created and maintained 26 web map services to be used throughout the European theater of operations. 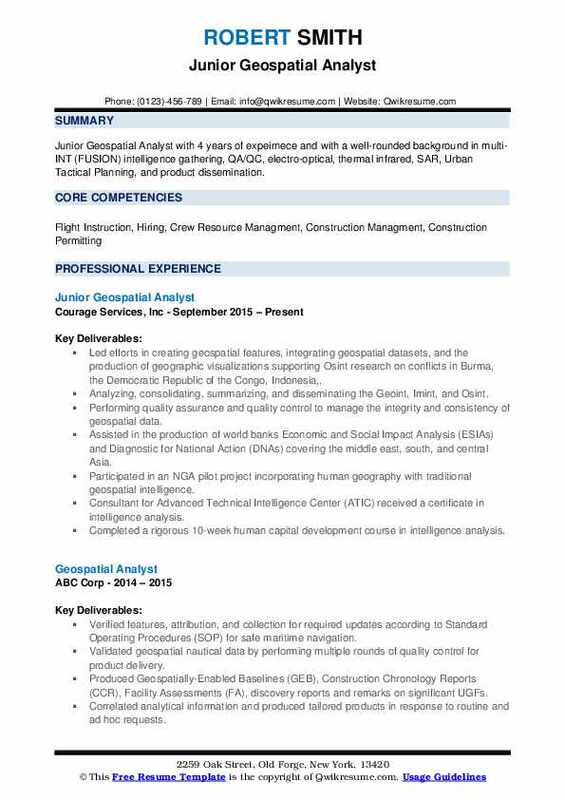 Cross-trained with an Analyst at the Nato Intelligence Fusion Center and assisted on the production of individual country high-value infrastructure analysis models. Ensured deploying units were provided tailored and vetted products to improve situational awareness. 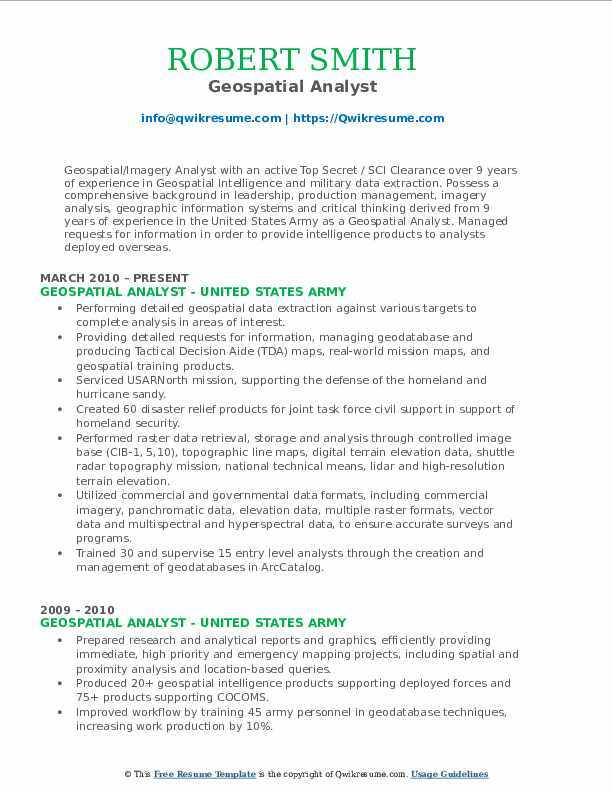 Summary : Geospatial/Imagery Analyst with an active Top Secret / SCI Clearance over 9 years of experience in Geospatial Intelligence and military data extraction. Possess a comprehensive background in leadership, production management, imagery analysis, geographic information systems and critical thinking derived from 9 years of experience in the United States Army as a Geospatial Analyst. Managed requests for information in order to provide intelligence products to analysts deployed overseas. Serviced USARNorth mission, supporting the defense of the homeland and hurricane sandy. Created 60 disaster relief products for joint task force civil support in support of homeland security. Performed raster data retrieval, storage and analysis through controlled image base (CIB-1, 5,10), topographic line maps, digital terrain elevation data, shuttle radar topography mission, national technical means, lidar and high-resolution terrain elevation. Utilized commercial and governmental data formats, including commercial imagery, panchromatic data, elevation data, multiple raster formats, vector data and multispectral and hyperspectral data, to ensure accurate surveys and programs. Trained 30 and supervise 15 entry level analysts through the creation and management of geodatabases in ArcCatalog. Finalized the team products through QA/QC, utilizing imagery and vector data processing, image mosaics, digitizing, elevation data and orthorectifications to maintain unit standards and fix all errors. 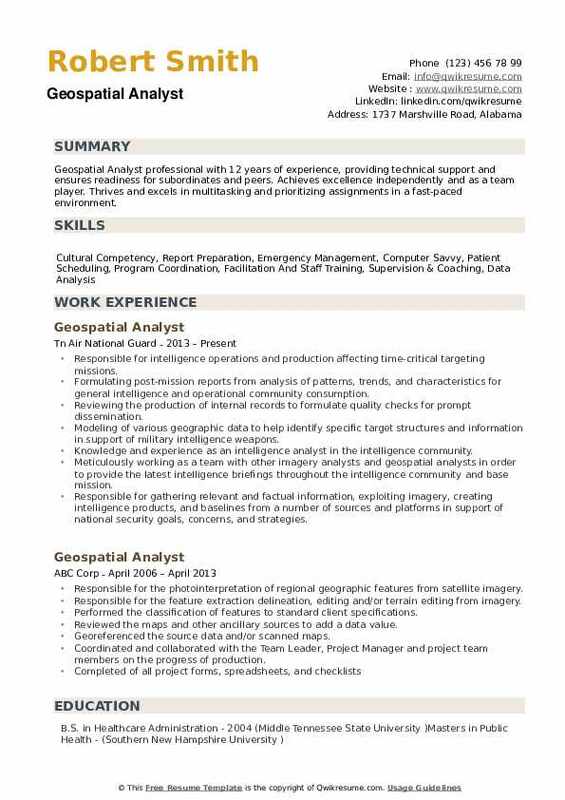 Summary : Geospatial Analyst with experience working on several different projects and producing many types of geospatial products and data. Ability to learn and pick up new products and projects quickly. Proven ability to be a corporate steward through active engagement with executive management and multicultural peer group to drive the vision of senior leadership is supported by Geographic Information Systems Certificate and Geodatabase Design and Maintenance Certificate. Placed annotation and prepared data for production of PDFs and printed maps. Utilized ArcMap model builder to create tools and improve production speed. Performed quality control of data products employing various QC tools including gait and gis data reviewer. Worked with team leads and fellow analysts to improve workflow and incorporate new tools. Preparing, producing, maintaining and updating a variety of maps, drawings, plans and other graphic representations displaying layers and attribute data from databases, using cartographic techniques to represent spatial data. Developing and maintaining the data layers, using GIS tools, CAD tools, FME and relational databases; supports detailed spatial analysis including notifications, buffering, and zone consolidation. Manipulating images for electronic mapping, entering the attribute data pertaining to specific features into a relational database. Incorporating maps, charts, data files, spreadsheet data, documentation and text into reports. Objective : Military Officer and Geospatial Intelligence Analyst with deployed field time in South Korea, Lebanon, and Afghanistan. Extensive experience in developing and implementing solutions, detailed analysis, and leading large teams to collaborate for a common mission. Supporting the air force ISR enterprise by analyzing real-time FMV feeds in support of tactical units. Leading up to three analysts in exploiting up to twelve simultaneous FMV feeds. Performing geo-locational mensuration functions, extracting coordinates, and determining positional relationships in real-time and processed imagery. Creating time dominant imagery products and reports to fulfill established, and ad-hoc collection requirements. Performing Area of Responsibility (AOR), Target Research, and Order-of-Battle (OOB). Performing moderately complex GIS finishing cartographer activities and quality assurance using ESRI software involving both manual and automated processes. 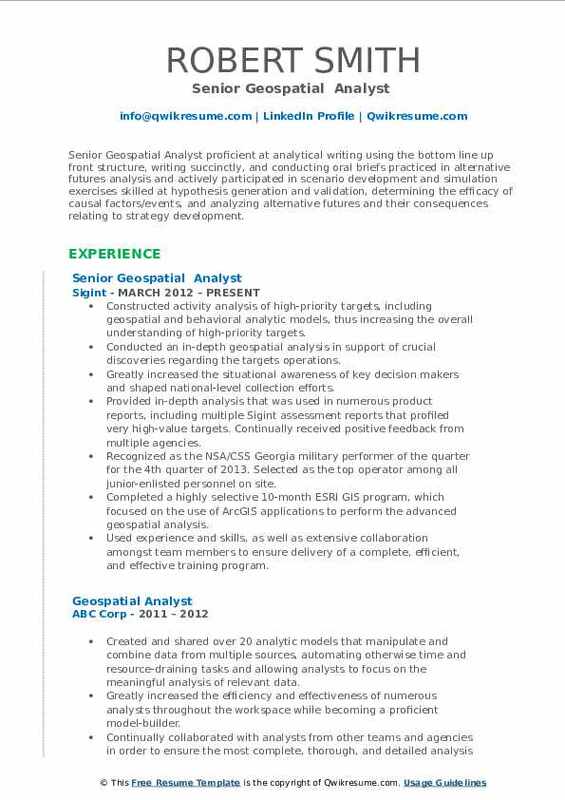 Summary : Geospatial Analyst professional with 12 years of experience, providing technical support and ensures readiness for subordinates and peers. Achieves excellence independently and as a team player. Thrives and excels in multitasking and prioritizing assignments in a fast-paced environment. Responsible for intelligence operations and production affecting time-critical targeting missions. Formulating post-mission reports from analysis of patterns, trends, and characteristics for general intelligence and operational community consumption. Reviewing the production of internal records to formulate quality checks for prompt dissemination. Modeling of various geographic data to help identify specific target structures and information in support of military intelligence weapons. Knowledge and experience as an intelligence analyst in the intelligence community. Meticulously working as a team with other imagery analysts and geospatial analysts in order to provide the latest intelligence briefings throughout the intelligence community and base mission. Responsible for gathering relevant and factual information, exploiting imagery, creating intelligence products, and baselines from a number of sources and platforms in support of national security goals, concerns, and strategies.